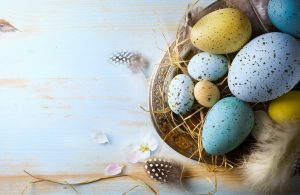 Why isn’t Easter this Sunday? Easter most generally falls on the first Sunday following the first full moon following the vernal equinox. The 2019 vernal equinox came on March 20 at 21:58 UTC. The full moon crested less than 4 hours later on March 21 at 1:43 UTC. So why isn’t this Sunday Easter? That is, April 21 will be the date for Western Christendom. More about that below. Ecclesiastical Easter and an astronomical Easter usually do occur on the same date. For those of us who use the Gregorian calendar – the most widely used civil calendar in the world – the last time that they didn’t was 38 years ago, in 1981. The next time won’t be until 19 years from now, in 2038. Now about that date, April 21. Not all of Christendom will adhere to it. Easter Sunday for Eastern or Orthodox Christendom will fall on April 28, 2019. That’s because the Eastern Church bases Easter on the old style Julian calendar, instead of the revised Gregorian calendar used by Western Christianity and most of the world.